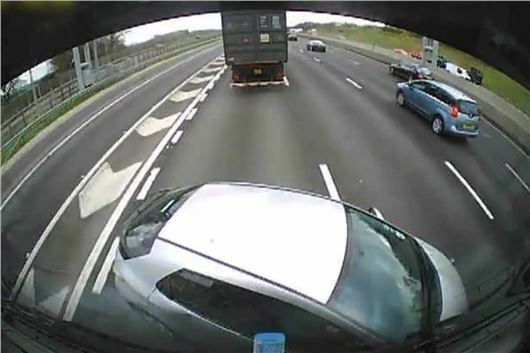 A SmartWitness dashboard mounted camera recorded the moment a Honda Civic sideswiped an HGV and was then pushed sideways 100 metres along the M25. The video at the bottom of the page shows the incident as it happened. It conclusively proved that the collision was wholly caused by the car driver and shows the skill of the HGV driver in keeping the car stable and preventing a far worse crash. The driver could have been facing at an expensive insurance claim from the Honda Civic’s driver cooked up by parasitic crash damage compensation specialists. But thankfully, a Smart Witness camera had been fitted to the lorry's dashboard, and the footage, pinpointed by GPS, conclusively proved beyond any doubt that the car driver was wholly to blame. Gary Humphreys, Group Underwriting Director for Markerstudy Group, said: "These cameras are a cheap and effective device to help innocent motorists and we expect they will become more commonplace. "Camera technology adds a visual element in helping insurers decide fault in the event of an accident, as well as providing individuals with evidence following road rage incidents or dangerous driving. "We have had claims for incidents on roundabouts and over lane discipline where the camera has proved vital in determining liability and has enabled us to avoid long drawn out disputes." He added that having a camera fitted can reduce premiums by up to 20 per cent. This new video, released by Smart Witness, shows the vital role of the camera. Smart Witness, managing director Simon Marsh, said: "Drivers worry that blame will always be attached to them when they hit another vehicle from the rear, particularly when there are no reliable witnesses. "In this case, the lorry driver was very relieved his Smart Witness camera meant he could quickly prove the crash was not his fault. "This latest video shows the risk which all motorists face on a daily basis and how efficient a Smart Witness camera is at revealing the truth. "Thankfully in this case, no insurance claim was filed against the HGV driver, but who knows what could have happened if the camera had not been there." Smart Witness systems have saved insurers £20million by providing evidence against fake whiplash and personal injury claims. ease of claiming in financially tough times. which have now become a £1 billion industry. He said: "The cameras can help protect drivers against 'cash for crash' scenarios. This includes deliberate severe braking in front of a driver to instigate a 'slam on' and subsequent whiplash injury claims. "They can also guard against 'flash for cash' claims where a driver flashes to let another out of a junction and then crashes into them on purpose." The cameras fit onto the dashboard or windscreen and are powered from the car's 12v accessory socket or can be directly wired in. They record the driver's view of the road ahead and also monitor the car's location, speed, braking and impact G-forces. Smart Witness prices start at £149 for the standard model, rising to £239 for the professional edition used by the lorry driver in this incident. The system is recommended by major insurers for hauliers, fleet managers and private motorists. It is officially approved by Transport for London. While there is no doubting the failure in the car driver to give way,and the role the camera played, maybe it's time the DfT ran a series of ads on TV and in the cinema reminding motorists that the particular white line is a 'Give Way' - not a 'I've signalled, I'm going' situation which is now commonplace. Just how many accidents are caused by idiots sailing on to a major road at a crazy speed and not giving way? I agree with you Chris Redman. The other problem on slip roads are drivers that follow to closely the car in front. When several do this it's like a road block heading to the main carriage way. There is then no way for them to blend in with the other on coming traffic. Leaving a good space and zipping in with the other traffic would reduce jams and increase overall speed. I am an insurance broker based in the North East and we have installed over 500 smartwitness cameras in taxis during 2013. The cameras are supplied free of charge by Markerstudy Insurance. The initial results are very encouraging and will lead to a reduction in taxi insurance premiums in 2014 for camera fitted vehicles. I would expect that we will see an increase this year in the amount of private motorists having cameras fitted. forward of the driver’s eye line. to be an arm chair critic including myself.